IF YOU HAVE NOT OVERSEEDED YOUR LAWN IN THE LAST 4 YEARS, IT NEEDS TO BE MADE AS DENSE AS BRAND NEW SOD! IT'S TRUE. Overseeding is an overlooked activity in American home lawn care. Yardeners assume, incorrectly, that fertilizer is all that is needed to keep a turf thick and free of weeds. Grass gets tired. It needs to be revitalized every five or six years. As this file shows, overseeding is not difficult and the benefits support investing the modest amount of time it takes to make it happen. Overseeding is one of the most important lawn care tasks, yet few homeowners ever do it. So, you ask, if I fertilize my lawn properly, why do I need to add new seed, especially if my grass looks pretty good right now? The answer is grass is not immortal. After five or six years, grass plants will slow down their reproduction rates; they get tired just like we do as we age. Thin grass invites weeds. Overseeding compensates for that natural slow down of the turf's reproduction. There are two major benefits to overseeding every five or six years. First, you insure your lawn stays thick and dense, or if it has thinned, you will make it thick again. 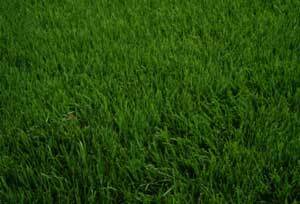 Thick grass has few if any weeds if it is mowed over 2 inches tall. The second benefit is disease resistance. The new varieties of seed you sow this year will have better disease resistance than those varieties already in your lawn. Your goal is to have a lawn that is as dense as brand new quality sod. Go to the garden center selling sod and try to spread the grass blades to see if you can see any soil. Usually, the grass is so thick you cannot see soil of brand new sod. Now go outside and check your own turf to see if by spreading the grass blades you can see any soil. It is likely the soil will be readily visible. That means your lawn needs to be overseeded. Early September is the best time to overseed, but wait until the evening temperatures begin to drop into the 50s; spring is second best. Because overseeding requires a bit of work, I suggest you overseed only about 5,000 to 6,000 square feet at a time (10,000 square feet is a quarter of an acre). The first step is easy. Mow the overseeding area with the mower adjusted to its lowest setting, even if it is scraping soil sometimes. If you have a bagging attachment to your mower, collect the clippings. Whether you have a bagger or not, here comes the sweaty part. You must rake the overseeding area thoroughly with a grass rake, leaving just stubble and bare soil with no debris. The reason for this step is that grass seed will not germinate if it is not in direct contact with the soil. If it is sitting on thatch, grass clippings, or on any other debris, it is nothing but bird food. This short grass stubble makes a great seed bed, once the debris is removed. Unlike when starting a lawn from scratch on bare soil, the stubble protects the seed from washing away in heavy rains. The label on the grass seed box will indicate how many square feet can be seeded with its contents either for a brand new lawn or for overseeding. The average recommendation for cold weather seed is 5 pounds per 1000. square feet. I recommend using the figure for the brand new lawn even though you are in fact overseeding. If you are seeding a brand new lawn and want the grass to look like the green on a golf course up the amount to 10 pounds per 1000 square feet. You should use lots of seed because the key to successful overseeding is watering, and most of us fall down on the watering job. Once grass seed is spread and moistened from that first watering, it should never be allowed to dry out; it must always be kept moist until you get full germination. That means watering new seed at least twice a day for at least two weeks. If you miss a day or two and the seed dries you may lose up to 30 percent germination -- they don't tell you that on the seed box. One way to give yourself some leeway on the watering task is to cover your overseeded area with a product called "GrassFast" from Dalen. It's a very light spun polyester material that allows light, air, and water to penetrate, but it keeps the seed from drying out as fast and will definitely improve the seed germination rate. After two or three weeks, you remove the material and store it in the garage for next year's overseeding. Mow the overseeded lawn when the old grass reaches three inches in height.